The Riwo Sang Chö (The Mountain Smoke Offering Ritual) is very powerful and has many benefits. While it is not required to contribute to the offering substances, it should be understood that this ritual operates on the principle of making offerings to four classes of beings to accumulate merit and repay one’s karmic debts, so making offerings is important to its effectiveness. Generosity in making offerings is considered very meritorious, and offering that which is of the best quality essential. Any amount, small or large, is certainly welcome. First are the guests invited out of respect: the Three Jewels – the Buddhas, their teachings and the Arya Bodhisattvas throughout the ten directions and the three times, and the Three Roots – the infinite mandala of Gurus, Yidams and Dakinis and the Dharmapalas. Making offerings to this assembly of rare and precious ones enables us to gather the two accumulations, purify the two obscurations, and attain the two kinds of siddhi. Secondly, to those invited because of their qualities: the protectors. This refers to the local deities of every place and continent, the earth-lords, devas and nagas, the planetary and stellar forces, guardians of the directions, the four great kings and the seventy-five glorious protectors of pure abodes together with their retinues. They help to pacify all illness, destructive influences, adversity and obstacles and to bring about every kind of virtuous and positive circumstance and favorable condition, effortlessly and spontaneously, and to accomplish our wishes. The third class of guests are invited out of compassion. This refers to all sentient beings wandering throughout samsara and tormented by suffering: the realms of the gods, demigods, human beings, animals, hungry ghosts and hell-beings. They are freed from their karmic delusions, suffering and the habitual tendencies of their respective realms. In the short term, they come to possess all the riches and enjoyments of the devas and ultimately become Buddhas, awakening spontaneously in the pure Buddha realm of Akanishtha. Fourth are the guests to whom we owe karmic debts. By offering to these obstructing forces, all the debts that we and all beings have accumulated throughout our infinite lives without beginning, even during our present lifetime, are repaid. These include debts that shorten our lives because we have killed, debts that plague us with illness because we have attacked and harmed others, debts that make us poor because we have stolen, debts from accidentally killing humans and animals. Our debts are repaid; we are freed from our karmic obligations and delivered from the deadly vengeance of karmic creditors. 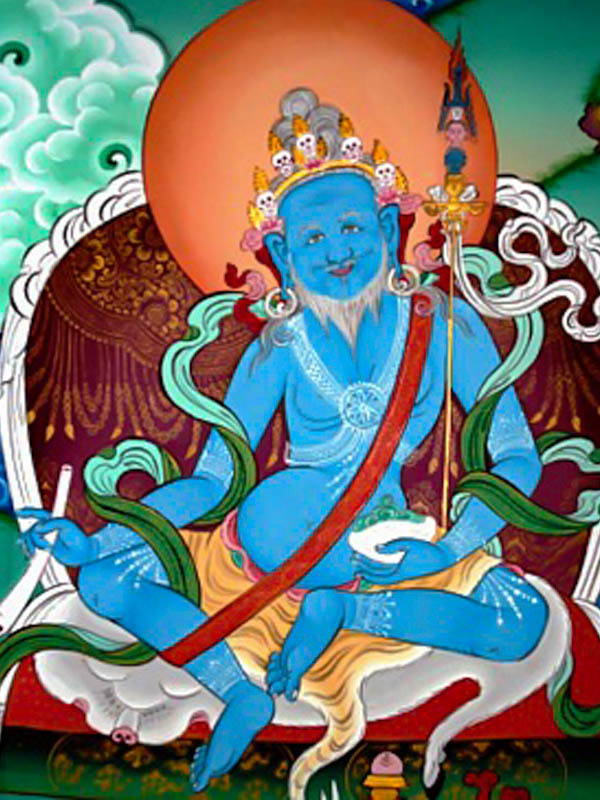 The creditors themselves are freed from their karmic obscurations and all their suffering, and in particular, they are freed from their malicious intentions and tendencies to harm others, and gain loving kindness, compassion and precious bodhichitta. It is very important for the sang offerings to be clean. The offerings can be quite small for an individual’s morning practice, a few teaspoons of the “sangdze” (dze Tib. offering substance) is sufficient, though elaborate versions can consist of 10 or more large trays of heaped offerings along with beer and wine. We then infinitely expand the offerings by visualizing them as billowing clouds that fill the extent of space. Traditionally the offering substances consist of a mixture of “the three whites” (butter, yogurt and (powdered) milk) and “the three sweets” (sugar, molasses, and honey) in a base of whole grain flour. Other offering substances can be added such as incense and/or fragrant herbs, flowers and plants (i. e. fresh juniper, cedar or pine branches), 5 colored silk cloth cut into small pieces, herbal medicine, alcohol, and small or powdered precious stones or jewels, gold and silver leaf, etc. The main restrictions are that whatever is offered into the sang fire contains no onion, garlic, meat or eggs (unless it is a minor ingredient in some baked goods) and is not old, stale, impure or left overs. All kinds of grains such as wheat flour, oatmeal, barley/tsampa and rice can be used, and western baked goods such as cakes and cookies, salty snacks and candy can also be offered. The fire itself is traditionally best made with wood from fruit trees or from fragrant pine and cedar wood. The site of the fire should be clean and well laid out and it is important that all of the materials used to create the fire are clean and were not previously used for any other purpose. It is important that the sang and sur fires be laid in separate locations given their different purposes.